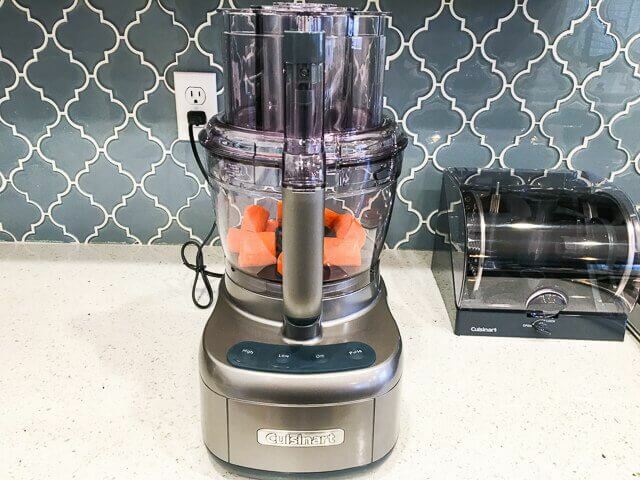 We spend 3 weeks testing this newest model of the Cuisinart food processor family, during my busiest cooking holiday, Chinese New Year. 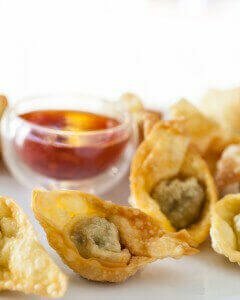 We made homemade potstickers, wonton, egg/spring rolls, each filled ingredients processed by the Cuisinart Elemental Food Processor with the Dicing Kit. Neither PRO nor CON, but something to consider: After removing all the parts, I laid out all the pieces and a little overwhelmed! Where am I going to store all these pieces? My pantry shelves are not tall enough to store the base motor with the bowls and lid attached. 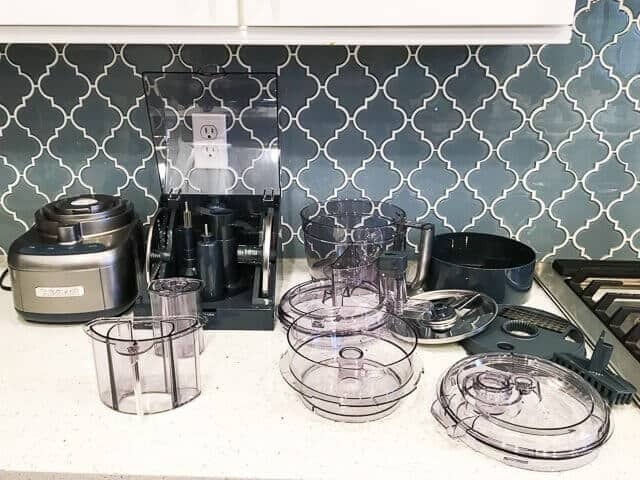 The good news is that the unit comes with a locking case for the blades (my previous Cuisinart food processor didn’t come with a case, and all the blades are just stored loosely in a plastic bin). The small work bowl nestles in the larger work bowl. The dicing kit parts (including the cleaning tool) all nestle into the included storage bowl. Holds all the sharp stuff. 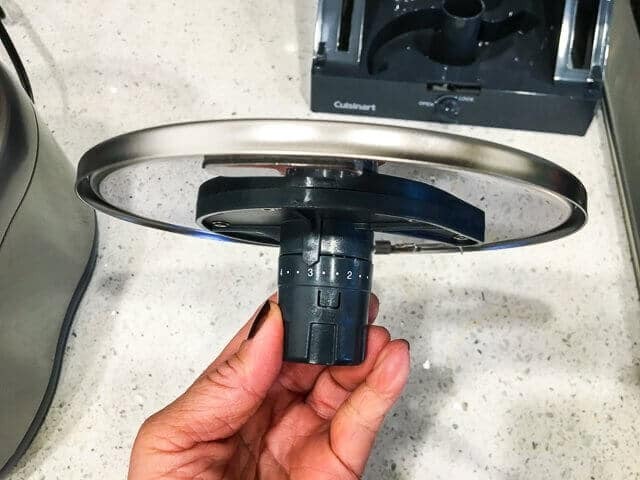 Let’s just jump in here and talk about my favorite feature of the Cuisinart. PRO: The base is LIGHT!!! I can hold and lift it with one hand. 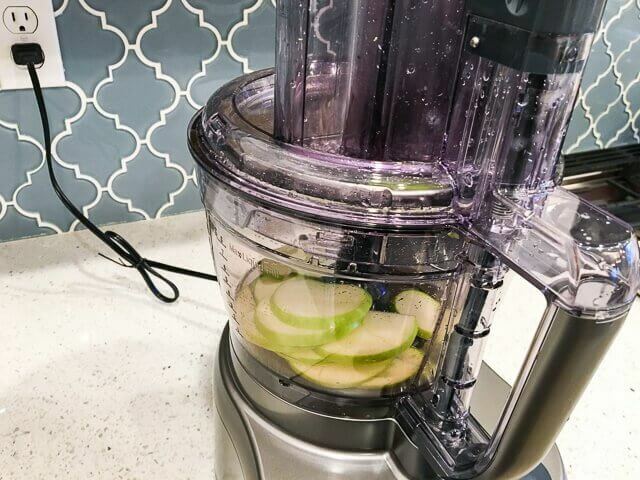 Surprisingly, the lightness doesn’t affect the machine’s performance – no wobbles, no creeping on my counter, and standard food processor noise. 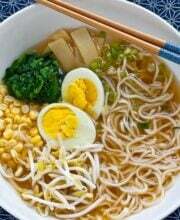 The bowl locks smoothly and easily onto the base. Just line up the handle towards the front-right, and twist to the left. The lid was a little more finicky when using the slicing disc and adapter. After failing to get the machine to engage, I had to take every part off and disassemble, and then reassemble again. But I think because it was a new machine for me, it just took getting used to the feel of when each piece “locks” into place. PRO: Love the wide mouth of the chute. It used to take me more time to cut/re-cut ingredients to fit a narrow hole than it did to just slice everything by hand! 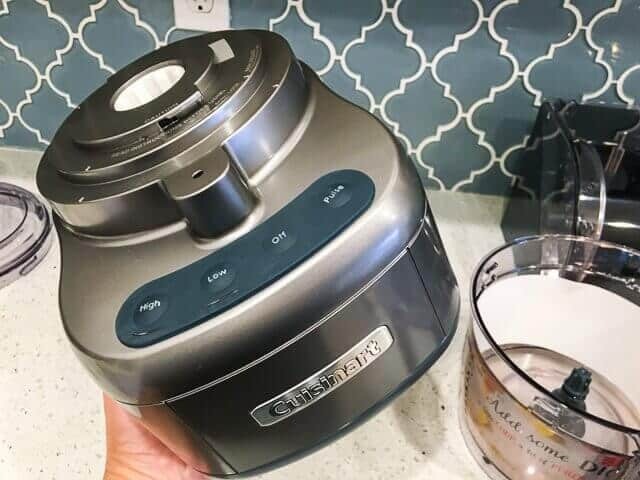 The large bowl size is generous, great for processing a big batch of food without having to continuously empty to refill. I’ve never had a “mini-bowl” for small batch, and just realized how useful it is! Before, for small batches, I never used the food processor. 1. It was heavy to lug out 2. Too many parts to wash for just a little bit of food. 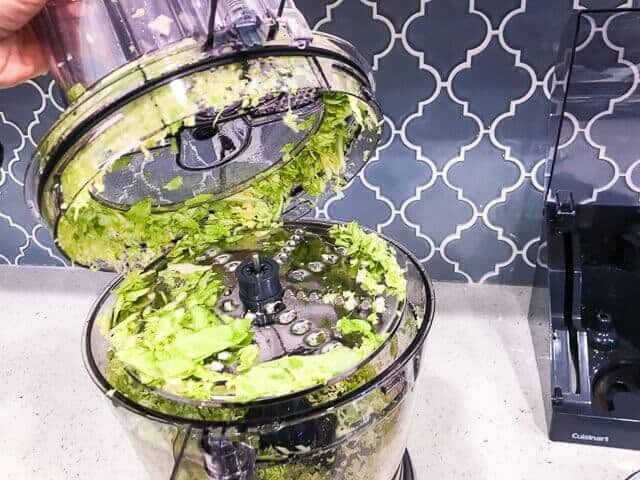 Plus, a small amount of food doesn’t process well in a big bowl. It’s still a lot of parts to wash for a little bit of food (I can just as easily use my sharp chef’s knife and then only have one item to wash) but at least the smaller bowl processes the food better, especially when making creamy hummus. 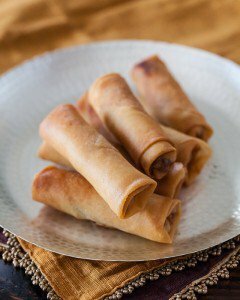 The first thing we processed was large carrots for My Mother’s Famous Chinese Egg Rolls. 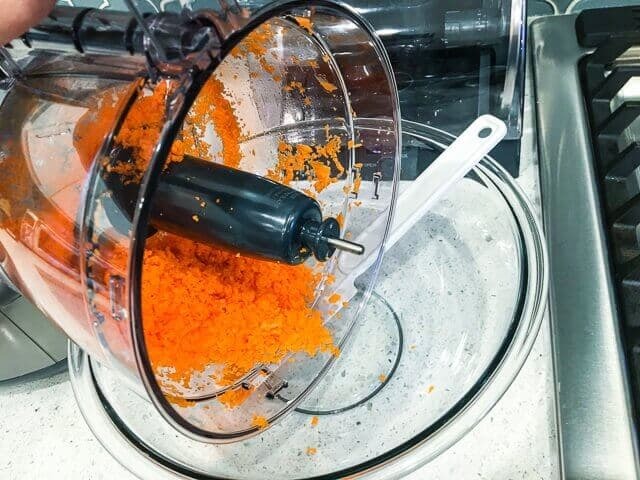 Normally, I would shred the carrots, but I wanted to test the power of the Cuisinart – who will it do to large, thick, chunky carrots? PRO: The answer is a very even, impossibly small mince, without the carrots becoming mushy. 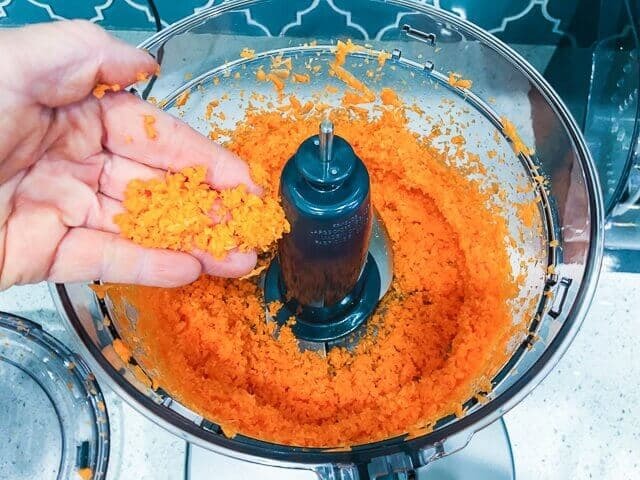 No stray chunks of carrots, every piece was beautifully processed. PRO: One handed dump into the bowl, without the blade falling. 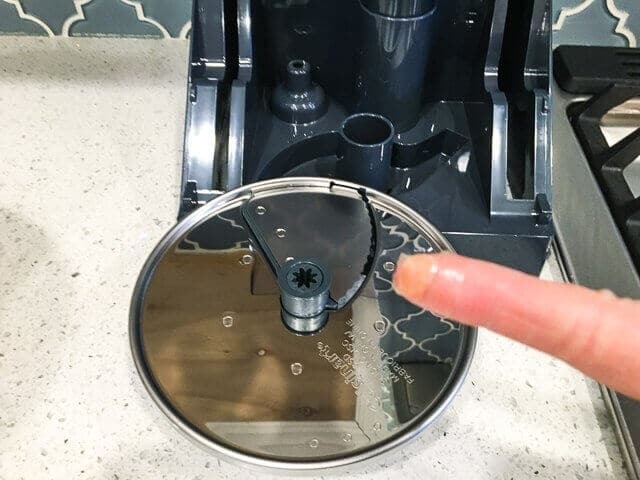 My old Cuisinart required you to stick your finger in the bottom of the bowl to hold on the blade to prevent it from falling out. The blade is a little funny looking! But it works. CON: After washing, the blade is still stained with carrot. I now have an orange blade! 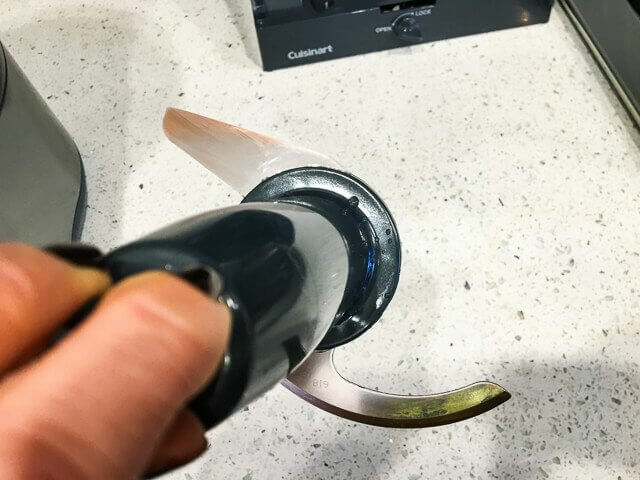 The slicing disc is adjustable! Just turn the knob and the very sharp blade adjusts. Very sharp!!! Ouch. Be careful of this moving blade. Every time I look at this blade now, I get the shivers. 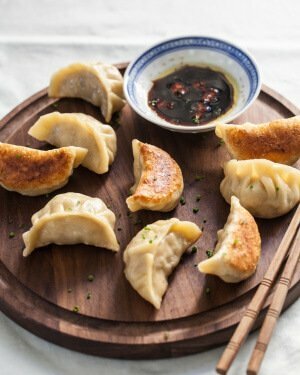 Sliced an apple, not for the dumplings, but just for a snacky-snack. 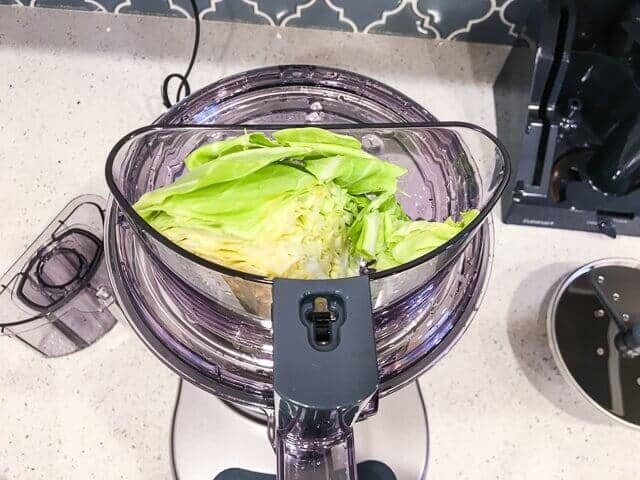 We’re shredding cabbage for both the egg rolls and the potstickers. 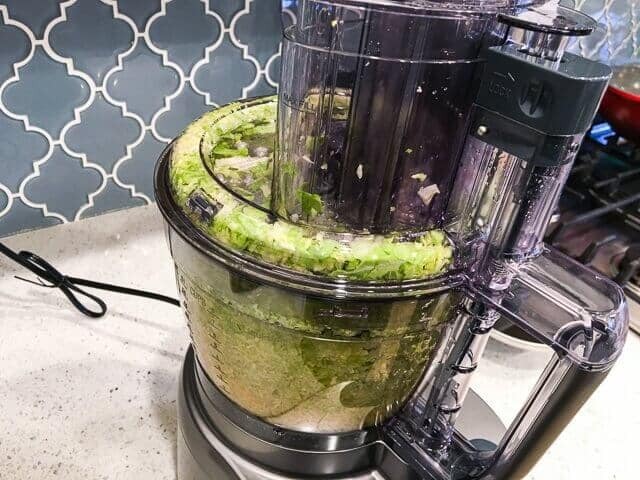 PRO: Nice wide mouth shreds a lot of cabbage at once. The shredding blade is reversible. One side is large shred, the other side is small. The shredding disc didn’t work that well for me. Lots of large pieces still stuck. CON: Because of the shape of the lid, look at the mess up in there! 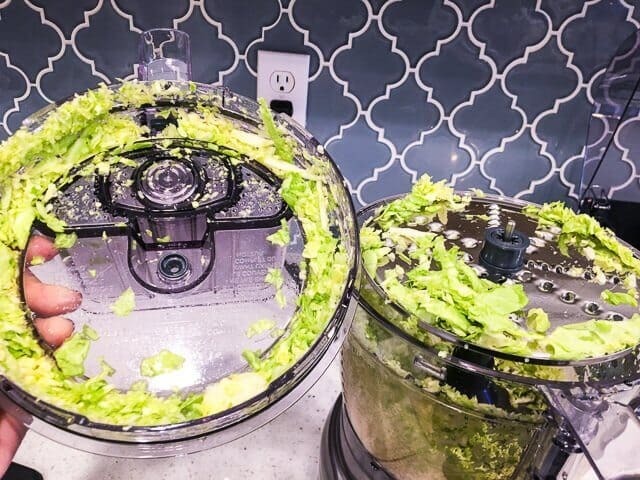 I think there was more cabbage stuck in the lid and above the blade than in the bowl itself. Where are my dicing photos??? 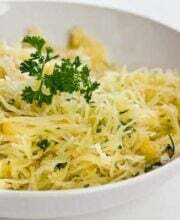 Argh, my phone ate the dicing photos! It’s okay, just watch this video. PRO: The dicing kit works really well, dices the tomatoes without overly smushing. I wish there was a smaller dice blade. 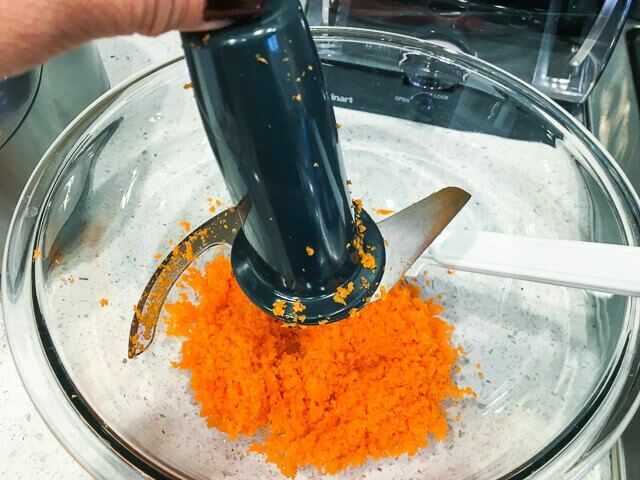 I’ve used the dicing kit many times, LOVE IT. 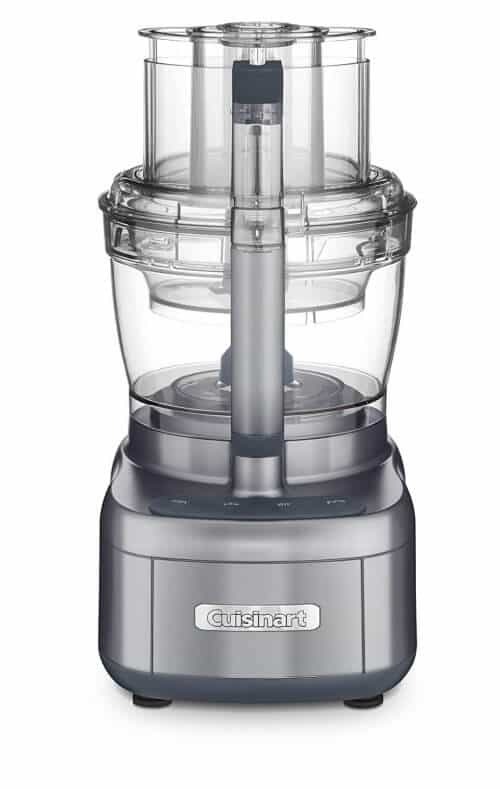 You can buy the Cuisinart Elemental 13-Cup Food Processor with Dicing Kit at $199 on Williams Sonoma. 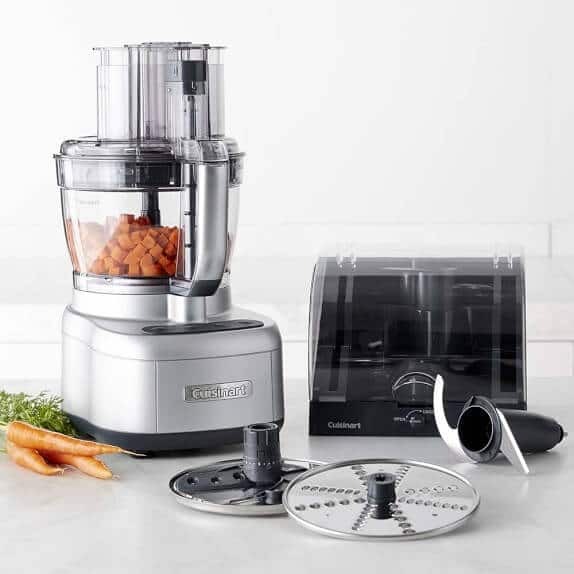 They also have a version of the Elemental with the spiralizer set instead of dicing, for $249. 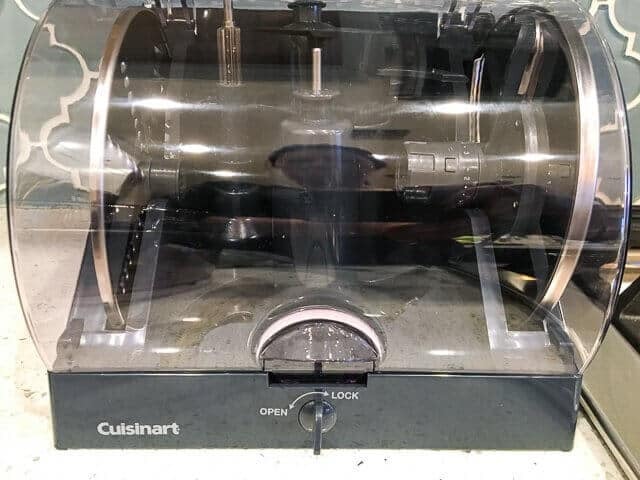 Amazon sells the Cuisinart Elemental with Dicing Kit for cheaper, at $160 (at time of publishing) and a smaller, 11-cup version for $130.